Out toward the pastures, woods, and fields. Stretched out, lightly striking the stalks. Strobe over your head. You do not care. Percussive clap, since you last walked those fields. No one you will ever know works that land now. It is as green as Eden. Life rises in the roots, in the leaves. 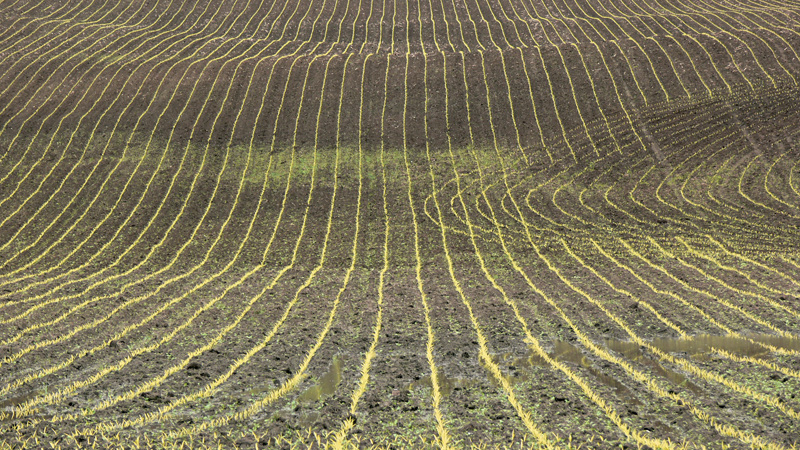 Neat texture… I love the look of freshly planted fields! I like how the curves on the right break the straight pattern. Good eye. I love the ‘abstractness’ of this image. Oh, that’s a bit mesmerizing – the sort of picture that could drive me bonkers if I looked at it too long! lol…what a find, Eddie. Definitely a big ut-oh there. “In beauty it is begun. In beauty it is ended.” The Navajo Indians, like this artist, saw and were immersed in it. Wonderfully timeless picture. Then I saw the curved swirl on the right and SMILED!! I thought, “Oooo, how cool. Someone has a sense of humor, or individuality, or rebellion to NOT follow the same path as everyone else. ” It made me laugh inside and feel happy again. Whether the swirl part on the right was made from that place, a playful place or not, I nonetheless felt that way. Like there is STILL magic in the world, STILL freethinkers, STILL uncontrollable elements. Then I saw the the odd patches at the foreground and realized they must be water (the reflections in them). They gave me the same sense of relief, like something breaking up the continuous sameness of the straight orderly lines. To me the water and the swirls on the right MAKE this whole photo. How amazing!1 I love it. This would also look great as a B&W. I really love the patterns, textures and the colours. Beautiful nature image. Nice structures. I like it. Awesome! Love the lines and love the color.